Vancouver drivers, as a rule, are courteous and mild-mannered. They stop for pedestrians, and they don’t often run yellow lights. Their most annoying characteristic is that they will happily drive slowly in the left hand lane on four lane highways. The “slower traffic keep right” concept seems unknown. Seat belts are mandatory for both drivers and passengers in British Columbia. Headlights should be on at all times, day and night. If you purchase a car in BC, the headlights go on when you start the car. 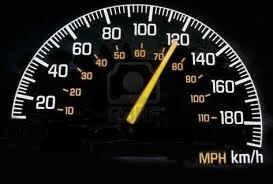 Canada is metrically oriented; therefore, driving distance is measured in kilometers, not miles. No large highways, expressways or freeways go either through or around Vancouver, so if you’re only passing through, you’ll do it on surface streets. Some traffic lights, instead of being steadily green, blink green. Blinking green traffic lights don’t turn red unless a pedestrian presses the walk button to stop traffic in order to cross the street. On streets with blinking green lights, the cross street has no traffic light at all, only a stop sign. Vehicles cross when the opportunity presents itself. Canadian highway signs are posted in kilometres per hour. 1 mile = 1 2/3 or 1.6 kilometres. Gas is sold in litres: 1 US gallon = 3.78 litres. You can buy it at stations in three grades: 87, 89 and 92 octane. Most Chevron stations also have 94 octane. Gas stations are self-serve; you pay for gas outside at the pump with a credit or debit card, or inside before you pump your gas. Gas prices usually don’t vary much from station to station so there’s no point driving around town looking for cheaper gas. It doesn’t exist. That being said, gas prices fluctuate, and it isn’t uncommon for the price of gas to go up or down several cents a litre from one day to the next. Gas tends to go up on weekends and holidays. No big surprise. Gas often costs less in outlying areas, so if you’re driving to Vancouver, fill up before you cross the border or before you get to town. Parking is not difficult in Vancouver because there are more than 350 above and below ground parking facilities. However, they are hard to spot since they are often located under or behind buildings. To find a parking facility, look for parking signs. The three biggest parking companies, with signs that signal their location, are listed below. Prices in Parkades (parking garages are called parkades in Canada) are about $6 an hour or $3 per half hour. Less centrally located garages are somewhat less. Parking meters range in price form $1 – $6 an hour depending on location. What’s annoying is that you often have to drive into the parking garage entrance before you can find out how much that particular lot charges. However, it’s usually worth it to get a parking place in a parkade (parking garage) since it eliminates searching for street parking which is the same price as garage and parkade parking. The other annoyance is that parking places in underground facilities are often remarkably narrow. If you park in a parkade with express terminals, take your ticket with you and pay for your parking at an express terminal before you return to your vehicle. Paying at the express terminal saves time and money. If you park on the street, avoid parking within 6 meters, about 19 feet of the corner, and don’t park near fire hydrants even if there are no signs or red curbs to warn you away. You can stop for up to five minutes in a No Parking zone to load or unload passengers or goods. However, you can be ticketed even for stopping in a No Stopping Anytime zone, even if you don’t leave your vehicle. If you run into problems while parking in a parking structure or lot, there is usually a contact number close by that you can call to solve the problem. 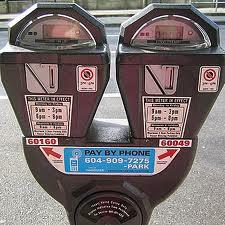 There are more than 6000 parking meters in Vancouver. Here’s some useful information about them. * In 2006, Vancouver introduced pay-by-phone parking. It’s a smart system. You can either call the number supplied on the parking meter to indicate your preferences, or download the app and follow the prompts. The company – Verrus – will contact you when your time is running out so that you can add more time without returning to your vehicle. There is a 45 cent surcharge. To learn more about this system, click HERE . * Parking Meters are most often in effect from 9:00 AM to 10:00 PM every day of the year. On some streets, parking isn’t allowed, even in metered spaces, during rush hour. * Most meters allow two hour parking, and some allow three. * Between 9:00 AM to 10:00 PM, vehicles can’t be left in the same parking space for longer than the maximum number of allowable hours. * Parking meter rates vary from $2.00 per hour to $6 per hour depending on the location. * Motorists are not allowed to park in a metered space if the meter is out of order. * You can Pay Parking Tickets by following the instructions you’ll find on the city’s Parking Ticket Payment Page.